Eid prayer starts around 6am, so I decided it best to stay with my Saudi friend the night before Eid so that I wouldn’t have to worry about finding transportation early the next morning to celebrate with her. I arrived to her home as soon as her brother, mother, and daughter were leaving to go pick an animal to slaughter. My friend (I don’t want to reveal her identity for security reasons, so we will call her Sara for the sake of the story) told me that her aunt also sent a sheep to the family, and it would be arriving shortly. I was greeting her sisters when the first sheep came. We all gathered around the window to see what was happening. Her brother opened the back of his SUV to reveal the most plump sheep I have ever seen. 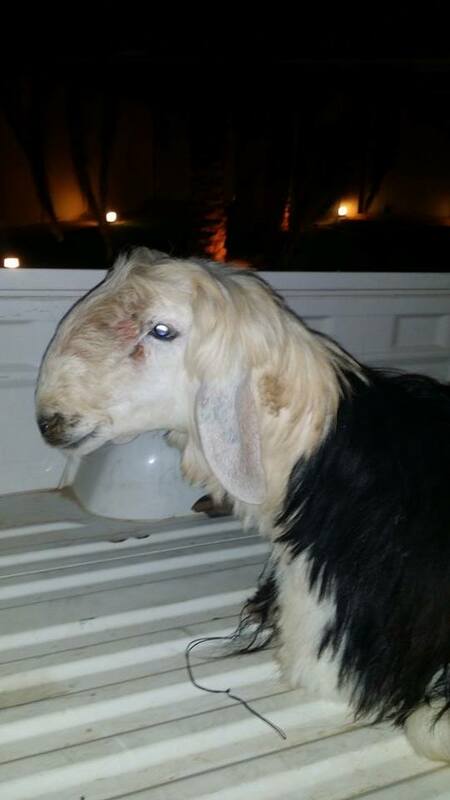 The room erupted in giggles, surprised that such a fat sheep fit in the back of the SUV. Again the room erupted in giggles while we watched her brother struggle to remove the sheep from the vehicle. When the sheep was finally in the yard, we realized how scared we were of it. It had beautiful, rounded horns, and despite being large and lovely, could run rather fast. When he first arrived he was a bit hostile, which resulted in 3 girls screaming and running behind the house, jumping over chairs, and losing hijabs. While we were hiding from the first sheep, Sara’s brother arrived with the 2 other sheep. Both were stowed away in the bed of his truck, and seemed quite content to be there. Getting them out was a struggle. They were quite peculiar looking, and I thought they were goats. 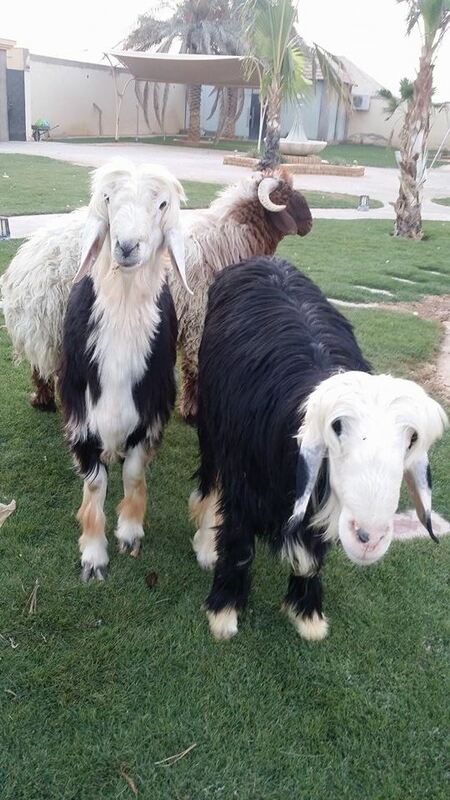 They are actually a kind of sheep that live here in Saudi Arabia. Sara told me the name of them in Arabic, but I don’t remember it. She told me that they don’t have these kind of sheep in USA. When the 2 sheep finally got out of the back of the truck, they kind of bullied the round horn sheep who bullied us humans. This didn’t last long, however, as they became fast friends and didn’t leave each others side. They seemed to be scared of us once they got together. They probably knew I was going to eat them. That night I sat outside with Sara, her mother, and her sisters. We sat on rugs on the ground, and just hung out. Even though I don’t speak Arabic, they really tried their hardest to make me feel welcome and included. Sara has a very sweet daughter who speaks perfect English, and she seemed excited to have a “friend” to play with. Sara’s youngest sister doesn’t speak English, but was excited to show me her bunnies (which I totally loved btw.) Really I don’t think the family could have been any sweeter to me. Someone brought some tea and snacks, and we stuffed our face for hours. 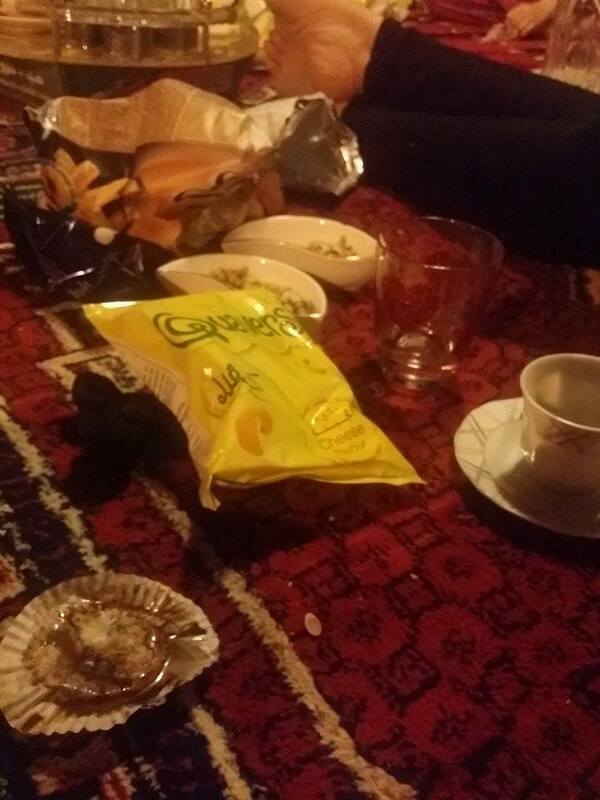 We ate seeds, chips, ice cream, and some Arabic snacks I have never seen before. Low quality photo. High quality snacks. At about 3am I headed to sleep for a while. Eid prayer was at 6am the next morning. It is very rare that women go to a masjid here, so I couldn’t miss my golden chance. Sara wasn’t going to attend, so I went with her mother and daughter. When we arrived to the masjid I was kind of surprised. The masjid was older and wasn’t as well maintained as I thought it would be. My mosque back home was much nicer. The women’s room was completely divided from the mens section, as in we couldn’t see them at all. I had never seen a mosque like that in USA, so it was different. Some ladies went by and gave a riyal or a candy bar to all the kids at the mosque, and Sara’s daughter was very excited to get these treats. I noticed a woman there who looked as if she was 90 years old. She really stood out to me, as she seemed so thankful and grateful to just be there. She moved slowly but exuded this radiance I just couldn’t put my finger on, and I wanted to know the story of her life. Sadly, like all the women there, she didn’t speak English. I was surprised to see how un-friendly the women were. At every mosque I had been to prior to this, everyone has greeted, shook hands with, and said salaams to everyone else in the room. Everyone kind of kept to themselves and their family here. 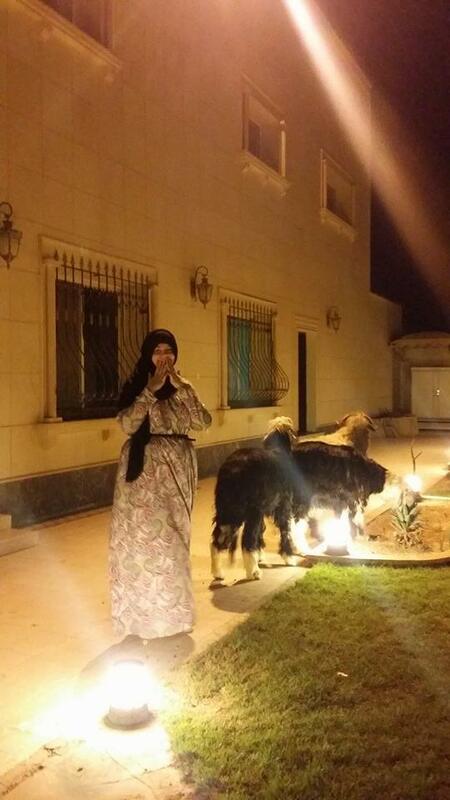 When we left the mosque, we went back to Sara’s home. The sheep were still a sassy trio, unaware that they would soon meet their fate. They enjoyed shaking their butts when they walked. How could I not fall in love with them? Shortly after the Eid prayer, Sara’s brothers and some hired helpers would come to sacrifice the animals and prepare them for cooking. I will share the photos of the slaughter and the details in a separate post. I understand some people are squeamish and sensitive, and that seeing those photos would upset them. If you are interested in the photos, please check back for my new updates.